Wow! 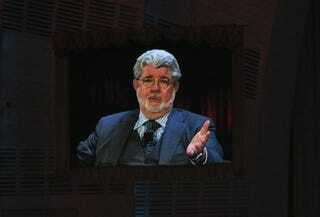 That's what I've got to say after listening to George Lucas speak at the World Business Forum today. The legendary filmmaker discussed everything: innovation, his movies being made for phones. In the "Future of Cinema" discussion Lucas was asked questions (by Ben Mankiewicz of At the Movies) about his accomplishments, but also about his drive to innovate new film technology (if you don't know Lucas has started a handful of film companies). "I had to invent what I didn't have," Lucas said. That technology included the ability to pan scenes of flying ships in Star Wars. "I wanted to simply pan around, so we had to invent a way of doing that. I was up there with Silicon Valley pushing that end of it," he added. It was then that Mankiewicz asked him how he feels about our technology getting "cheaper, better, faster." Lucas rambles a bit about how TV has to be developed differently than DVD or big screen movies, and Mankiewicz, as shown in this clip, leads him to the question, of whether he'd make movies for phones, to Which Lucas says, without hesitation, yes. He makes movies to be watched, no matter what devices people watch them on. That sentiment is a bit different than David Lynch's opinion. Of course, Lucas has also been a proponent of beaming movies into living rooms as soon as they hit theaters. Excuse the film quality, the suits took all the good seats.